Ala Eh, Champion Na Hari Pa! | Servinio's Sports Etc. Ala Eh, Champion Na Hari Pa! 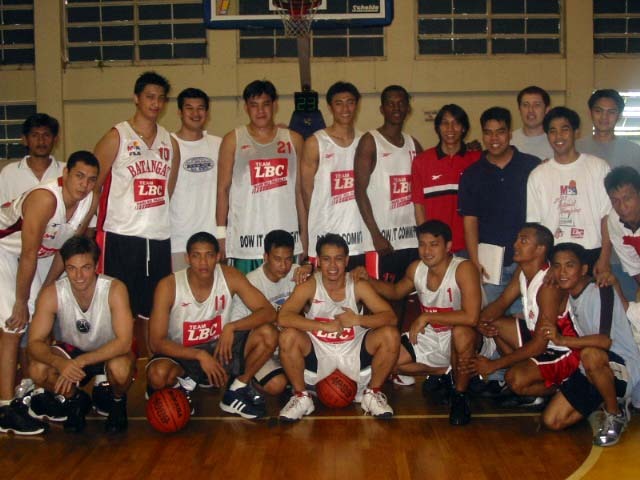 ONE of the more popular franchises from the old Metropolitan Basketball Association (MBA), the LBC Batangas Blades, will be holding a grand reunion next week in time with the 10th anniversary of their winning of the 2001 MBA National Championship. Members of the champion team are expected to attend along with all former Blades players, coaches, management and support staff. Surprisingly, the Blades were the last team to join the MBA’s inaugural season in 1998. The fledgling professional league had already awarded a Batangas franchise but they were suddenly abandoned by their sponsor at the last minute, forcing Coach Francis Rodriguez to take the whole team to Davao and become the Eagles. That forced the MBA to look for a replacement team and found a savior in brothers Santi and Dino Araneta of LBC, a top courier company. The brothers appointed young coach Binky Favis to handle the team. Coach Favis faced tough odds as the 11 other teams had already been practicing for some time and that the better players were already spoken for. Despite a ragtag roster, the Blades gave the field a scare and nearly made the semifinals. Coach Favis resigned before the start of the 1999 season, paving the way for his assistant Bong Ramos to take over. With an improved line-up, the Blades made the playoffs for the first time. The Blades began the 2000 season on the wrong foot and the losses slowly piled up, forcing management to replace Coach Ramos with his assistant Nash Racela to salvage what was left of the season. The team finished with a 12-14 win-loss card and missed the playoffs. Suddenly, the MBA announced that they would reduce the number of teams for the 2001 season from 14 to eight. The process involved several teams merging operations and the Blades found themselves pairing with the 1999 Manila Metrostars with the Blades as the surviving entity. The Blades thus took in former MVPs Romel Adducul and Alex Compton, forward Peter Martin and guard Jonathan Serrano. Brandishing a revitalized roster, the Blades bulldozed through the field with a 22-6 record and polished off the Negros Slashers in the National Finals, 3-1, for their only National Championship. Eddie Laure, who along with Jeff Sanders are the only players to play all five MBA seasons with the Blades, got the nod as the MVP while Coach Racela pocketed the Coach of the Year plum. Entering the 2002 wars, a back-to-back was highly possible with the team remaining intact, except for Adducul who transferred to the revived Osaka Pangasinan Waves. The Blades played to form and made the Phase One finals only to lose to the Slashers. The records were then disregarded and the Blades began their formal defense of their 2001 title with the opening of the regular season on June 15. Sadly, the financial woes that have been plaguing the MBA for the last two seasons became too big to bear for all the parties concerned. On June 30 or 15 days after the opening games, the final game in MBA history was played with Compton draining a buzzer-beater in the overtime to subdue the Pampanga Stars, 92-90, at the Lipa City Youth and Cultural Center. LBC spent for the venue’s refurbishment as the Blades’ home venue after playing their first four seasons at the Sentrum De La Salle. The MBA declared a suspension of operations to end a great chapter in Philippine basketball history. However, that was not the last fans would see of the Blades. After a series of negotiations, LBC decided to bring their act to the Philippine Basketball League (PBL). However, among the conditions set by the PBL was that Blades would only be allowed five former MBA players and filling the rest of the line-up with collegians. PBL Commissioner Chino Trinidad, whose family is from Lipa City, then scheduled several games at the LCYCC. Coach Racela chose Compton, Ralph Rivera, Jayson Cuevas and rookie Ariel de Castro plus 6’9” Vincent San Diego from the Slashers. For a newcomer, LBC did pretty well and made the semifinals only to lose to top seed and eventual champion Welcoat Paints which was led by former Blades Adducul and Laure. LBC would play one more conference before calling it quits from the basketball scene. These days, LBC is still involved in promoting sports but not with basketball. The company has sponsored an inter-school men’s volleyball tournament but their biggest project is the LBC United Football League. Surely, the UFL hopes to cash in on the growing popularity of football brought about by the recent success of the Philippine National Team. MBA – Arvin Adovo (1998), Tyrone Bautista (1998-2000), Rudolf Belmonte (1998), Rommel David (1998), Bernard de Guia (1998-1999), Jojit Duremdes (1998), Arnold Gamboa (1998-1999), Eddie Laure (1998-2002), Dennis Madrid (1998-1999), Sonny Manucat (1998-1999), Henry Ong (1998), John Ramirez (1998-1999, 2001-2002), Maoi Roca (1998-2000), Jeff Sanders (1998-2002), Boy Valera (1998), Phil Adams (1999), Oliver Agapito (1999-2000), Steve Antonio (1999-2000), Chris Corbin (1999-2002), Matt Makalintal (1999-2000), Ralph Rivera (1999-2002), Terry Saldana (1999), Brian Sison (1999), Christopher Tan (1999), Jayson Cuevas (2000-2002), Tony Boy Espinosa (2000-2002), Jayjay Helterbrand (2000), Lenny Reyes (2000), Romel Adducul (2001), Alex Compton (2001-2002), Radel Mapalad (2001-2002), Peter Martin (2001-2002), Jonathan Serrano (2001-2002), Ariel de Castro (2002). PBL –Froilan Baguion (2002-2003), MC Caceres (2002-2003), Ronald Capati (2002-2003), Jayson Cuevas (2002-2003), Alex Compton (2002-2003), Ariel de Castro (2002-2003), Al Magpayo (2002-2003), Chico Manabat (2002-2003), Paul Reguera (2002-2003), Ralph Rivera (2002-2003), Miko Roldan (2002-2003), Vincent San Diego (2002-2003), Harold Sta. Cruz (2002-2003), Nicole Uy (2002-2003), Allan de Castro, Erick Arejola, Joseph Dominguez.